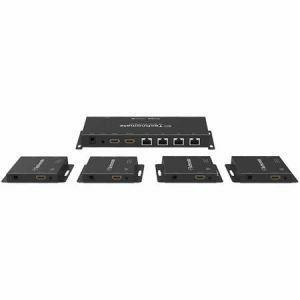 Based on the popular TM-RF HD, this is the latest 2018 version which is now compatible with an aerial input and includes many advanced menu options to configure your set up. 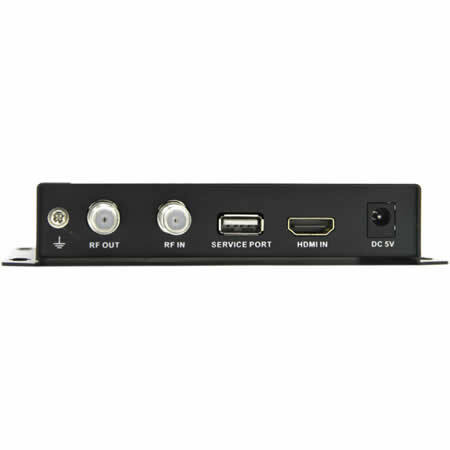 Connect any HDMI device such as a Satellite Receiver, CCTV system, Blu-ray player, TV Box, etc and watch it in crystal clear Full HD 1080p over a coaxial RF system. You can also watch on many TVs using a passive splitter or an amplifier (explained below). If you already have a Standard Definition RF distribution system but your source device is in High-Definition, just swap your existing RF modulator to this and watch in High-Definition 1080p Full HD on a DVB-T compatible TV. The cabling is exactly the same. *please note, TV must be 1080p Full HD or 4K UHD (HD Ready models are not compatible). 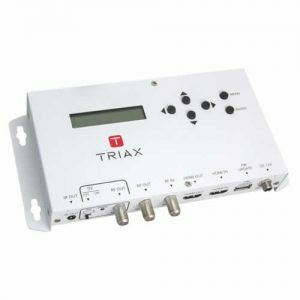 Infra-Red: Requires a mains powered amplifier/splitter, also known as a bypass amplifier/splitter and a device that can send 9V IR Infra-Red remote control signal over coaxial cable so that you can control the source device via remote control at every TV. 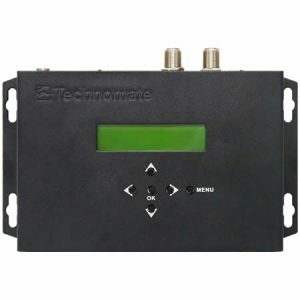 The Technomate TM-AMP B models are compatible. please click here to view them. Additional Infra-Red Receivers (“Magic Eyes”) are also available. Apart from the UK Channel 21-69 frequencies, the TM-RF HD is also compatible with all UHF international RF systems. Can also be cascaded with up to 35 TM-RF HD in one system so you can watch different devices on different TVs! Such as Satellite on TV1, another Satellite channel on TV2, CCTV on TV3, etc. To make cascading even easier and save time, you can upload the data to a USB device and configure the settings on your PC for each TM-RF HD and then download those settings back into the modulator. Compatibility: please note that this only works on 1080p Full HD & 4K UHD TVs. If your TV is 720p HD Ready, it will not work directly however, you can use a Freeview HD box (DVB-T2 box) with the TM-RF HD to make it work on an HD Ready TV. Lip Sync: the TM-RF HD has been tested with many devices such as Sky, Virgin, BT, Blu-ray Players, Playstation, Xbox and there are no issues. 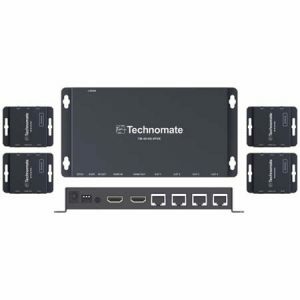 If you are having issues, please contact Technomate Support.